If you would like to arrive at your destination in the most reliable and easy way possible, whether it's from hotel to hotel or city to city, we recommend our private transfers with a professional, bilingual (English/Spanish) and certified driver. Based in the beautiful colonial city of Merida, we can take you anywhere you wish within the state of Yucatan. 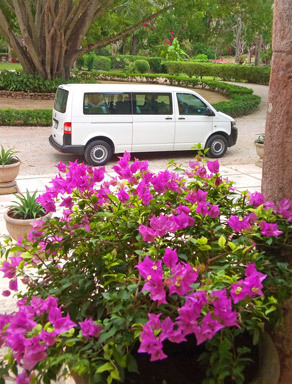 We can also offer transfers to destinations in Campeche and Quintana Roo, including pick ups and drop offs at Cancun airport, just so long as your transfer either starts or finishes in Merida. Private transportation is provided in a modern, air-conditioned and fully licensed and insured passenger van (with federal permits for the transportation of tourism) and a seating capacity of seven (with plenty of room for luggage), making this is the perfect option for couples, small groups, families and friends.